OMGeeee! How would you like to learn how to make thin and crispy homemade potato chips? We have tracked down the best recipe and you won’t want to miss it. View the video now. We are always looking for the best homemade recipes and when we discovered this highly rated, whisker off a 5-star, potato crisps recipe, we couldn’t wait to share with you. 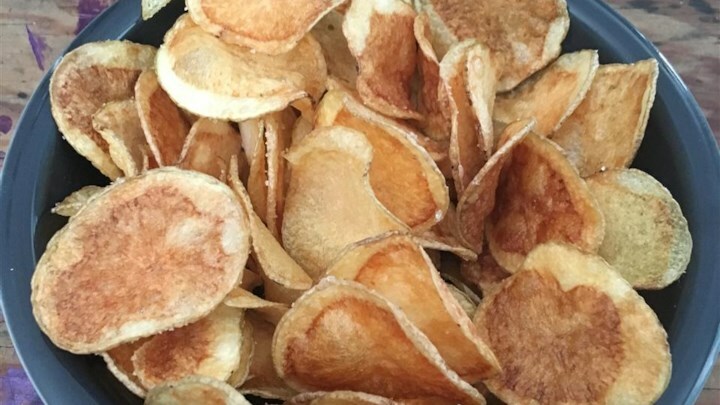 If you would like to learn how to make thin and crispy potato chips, you won’t be disappointed. They are so much healthier than store-bought and by all accounts, delicious. The secret to thin and crispy potato chips is to slice them with a Mandoline. This will give you the best possible result. Let’s check out what else you are going to need. Here’s a photo from Allrecipes member Curlylocks and you can see how well they turned out. Here’s what another member says. “I have tried these a couple times and the kids love them. What I really suggest is that you slice the potatoes thin and then soak in HOT water for 20 minutes. 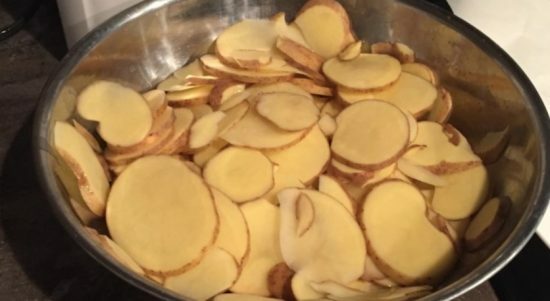 Almalou is the Allrecipes member behind these Potato Chips and she used her Food Processor’s slicing attachment to make hers. She says you can make them thicker if you prefer.